The State Library is proud to recognize three Native Americans who have recently received their Master of Library and Information Science (M.L.I.S.) from San Jose State University. Jonna Paden of Acoma and Laguna Pueblos, Debbie Reese of Nambe Pueblo, and Elviria Aquino of Ohkay Owingeh all studied through the Circle of Learning (COL) program at the university. In addition to these three graduates, Jennifer Himmelreich, Dine from the Navajo Nation, is currently completing the program. Launched in 2010, the COL program’s goal was to prepare an increased number of American Indian and Alaska Native librarians and archivists to serve tribal communities. “The Circle of Learning project at San Jose State University not only provided funding for me to enter a graduate program, but I was also able to complete my program online. It was an invaluable experience,” Aquino says. 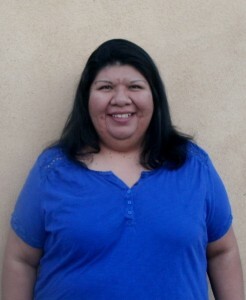 Aquino is a law librarian at the New Mexico Supreme Court Law Library in Santa Fe. She first worked at the Law Library as a library technician while earning her bachelor’s degree in museum studies at the Institute of American Indian Art. She considered whether she would pursue museum or library studies for her master’s degree, and she found the answer when she learned about the COL program. SJSU Graduate Jonna Paden, M.L.I.S. Paden is currently the Archives Intern at the Indian Pueblo Cultural Center (IPCC) Library & Archives. After completing her undergraduate degree at the University of New Mexico, Paden worked as a receiver and buyer at the IPCC and happened to come across information about the M.L.I.S. and various ways she could utilize the degree. She was drawn to it. By luck, she says, she stumbled on information about the COL program at San Jose State University. She quickly completed the necessary application requirements and was ultimately accepted into the program. Reese is the author of the American Indians in Children’s Literature blog which provides critical perspectives and analysis of indigenous peoples in children’s and young adult books, the school curriculum, popular culture, and society. Congratulations to these women for their accomplishments, and thank you for your service to the New Mexico library community!